We are proud to be able to offer this truly eye opening stencil driveway concrete refurbishment service to both residential domestic and commercial customers in Taunton, Wellington, Devon, Yeovil, Somerset, Bridgwater, Wiltshire, Dorchester, Dorset, Bristol, Gloucestershire, Weston-super-Mare, Exeter, Plymouth and Surrounding Areas. Resurfacing is quickly becoming the go-to solution in respect of the current economic climate. It is an eco-friendly process whereby we use your existing patio or driveway as a base, thus saving on money, time and land-fill. We can easily overlay your required design and colour to create a beautiful decorative finish. We have a wide range of pattern and colour finishing options available for you to choose from, allowing you to create the perfect complement to your property, style and taste. Please contact us for further information using the contact form on this page. Finally, a weed free driveway and patio system that actually works! Repairs / Restores / Re-colours! This is the only system that effectively re-colours, seals and welds the joints of the bricks or blocks together in three easy steps. 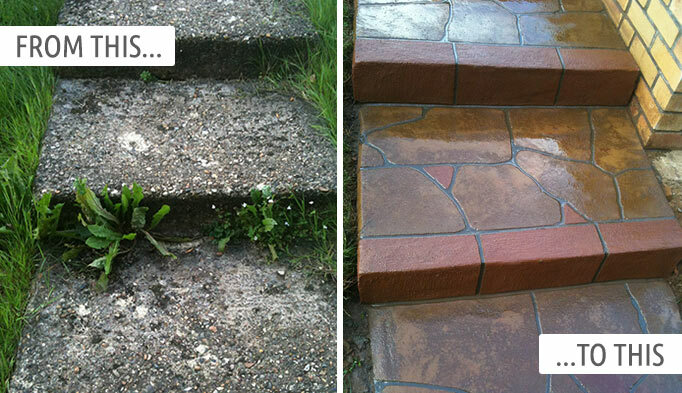 Pressure wash the bricks or block paving ensuing that all oils stains, algae etc. are removed. Throughout the pressure washing process, it is important to remove approximately 5mm of sand from within the brick joints, but care must be taken not remove more than this. Evenly distribute out a complete bag of the crystalline beads across the working area using a soft coconut fibre broom. Sweep in between the brickwork, filling the grouting joints carefully to the brim. Pour out the Crystalseal sealant, clear or coloured, directly onto the brickwork surface in a line. Then proceed to evenly spread the sealer with a soft coconut fibre broom, ensuring that the joints are completely soaked and filled with the sealer. Repeat this step for a full, high gloss finish. Paper Stencils of your chosen pattern or multiple patterns are carefully arranged on top of freshly evenly laid wet concrete. Two coats of your chosen colour resin dispersant are then applied and either rolled or floated in. Once the working surface has completely dried, the paper stencil is carefully removed. Control joints, when necessary, are cut into the working surface. Finally, the protective resin sealant is applied to the whole working area making the surface completely stain resistant and durable. This resin sealant also enhances the colour. 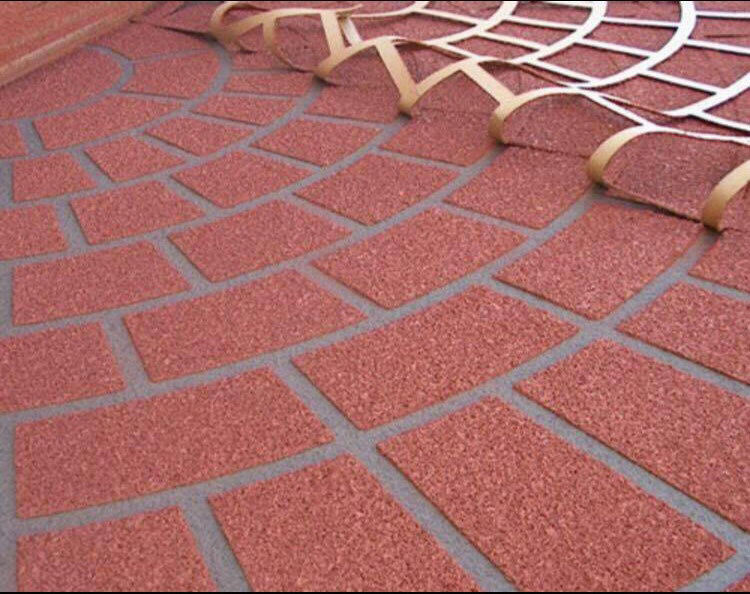 Pressure clean the brick or block paving surface before treatment. Carry out any repairs if necessary and prime the base. Apply a single base coat if required and lay the stencil paper across the working area for application. Spray the coloured resin topping over the stencil and onto the working area. Then carefully remove the stencil to reveal pattern. There likely won’t be but use a sharp knife to finish off any rough edges. Apply the resin sealant to finish. Despite the fact that the natural oxide based pigments that we use when colouring your new driveway or patio are weather-proof and fade resistant, the use of the liquid acrylic sealant is necessary to draw out the beautiful tones and hues that you have picked. We need you to be as pleased with your new driveway or patio as we are, having your beautiful patio or driveway cleaned and resealed at normal intervals will give it years of excellent service to you. We will even now be there numerous years after the job is done to give you our aftercare support and service that is guaranteed. Due to its high-shine, wipable polymer finish, the acrylic sealer we use will perform the task of completely protecting your driveway or patio surface against the elements and any potential staining that may occur. This allows any contamination such as bird droppings, algae or mould formation, to be easily cleaned from the surface. We recommended that you have your driveway or patio pressure washed, cleaned and resealed by us as your local Taunton installation contractor, at intervals of 3-4 years domestic or residential use, and 2-3 years’ commercial use. 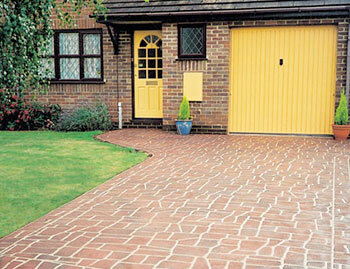 Contact Your Local Taunton, Somerset, Devon & Bridgwater Stencil Driveway Service Contractors NOW for a free quote!